I have been making different versions of this make ahead scrambled egg recipe for years. You can easily change up the mushrooms to a different vegetable. The recipe can easily be doubled for larger groups or halved for a family of 6 and is great to serve for any meal of the day. Add cubed ham or farmer sausage on top of the scrambled eggs before adding the soup if desired. In a large fry pan, melt 1/4 cup (half of the full amount in ingredients) butter and add mushrooms. Fry until browned and the liquid from the mushrooms has reduced. Add the mushroom soup, sherry, and processed cheese spread. Stir together until heated through. In a large bowl or blender container, beat the eggs together with the milk until well combined. In a large fry pan, melt the remaining 1/4 cup butter on medium low heat. Add the beaten eggs and stir until the eggs are just barely cooked. They should be still a bit wet. Don't overcook. 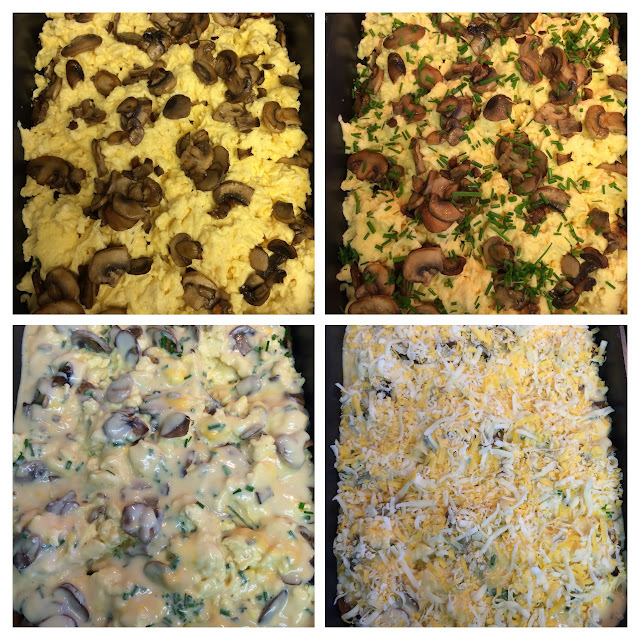 Arrange the scrambled eggs evenly in a greased 9 X 13 pan. Add the mushrooms and then green onions. Pour warm mushroom soup mixture on top. Bake at 250 for 50 minutes. Hi Ellen and thank you so much for your visit today! Oh, my goodness! This dish looks wonderful. 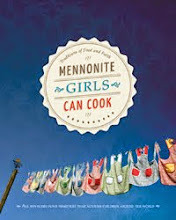 I have to admit, I've made some of your 'Mennonite Girls Can Cook' recipes! You never disappoint! Have a blessed week. Wow - that looks so delicious. This would be perfect for a Mother's Day brunch. Have a most wonderful mother's day Lovella! 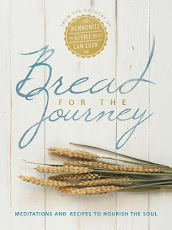 Ladies, we have read your blog for a long time now. Made a lot of the recipes. 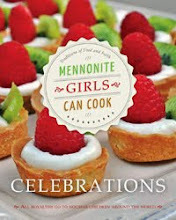 Loved a lot of the recipes. But I think you just made my kids drool. My kids have never been picky eaters, eating anything I've put before them. My 11 year old daughter is our main cook and has developed a love of mushrooms along with her 9yo brother. When reading this recipe my 2 15yo daughters piped up that they like them as well, but maybe not with the same zeal as the other 2. My 10yo son camps with me though, we'll pass on the mushrooms. They are looking forward to making this and all the glorious mushrooms in it. Now I have a question...do you make your own mushroom soup? I need a recipe for that one. The particular menu can simply become doubled regarding greater teams or perhaps halved to get a category of 6 which is fantastic to be able to assist for almost any food with the evening. Increase cubed pig or perhaps character lean beef together with the particular scrambled offspring just before incorporating the particular soup when wanted.